“That’s it! I can’t walk anymore. 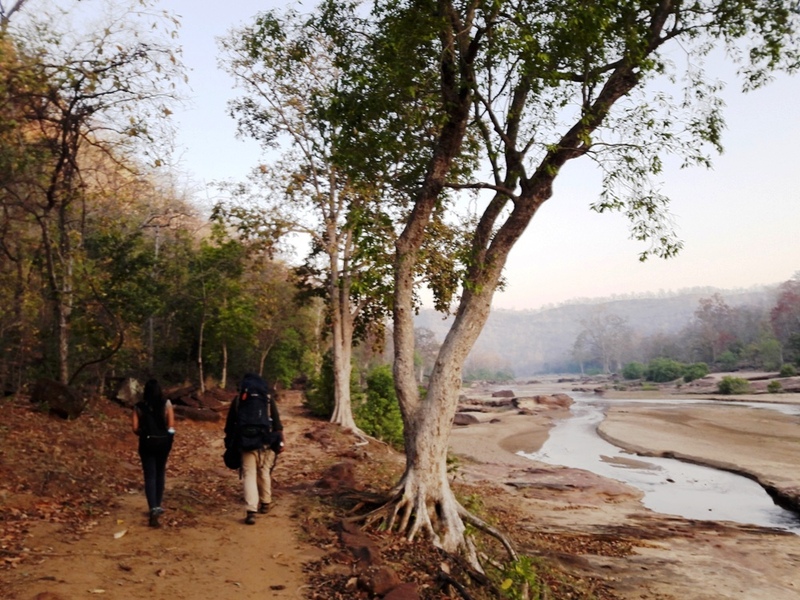 I’m going to give up?” I thought several times while trekking in the Satpura Tiger Reserve. I was doing the Panchmarhi trail under the Satpura Under Canvas programme, a unique walking safari by Reni Pani Jungle Lodge. 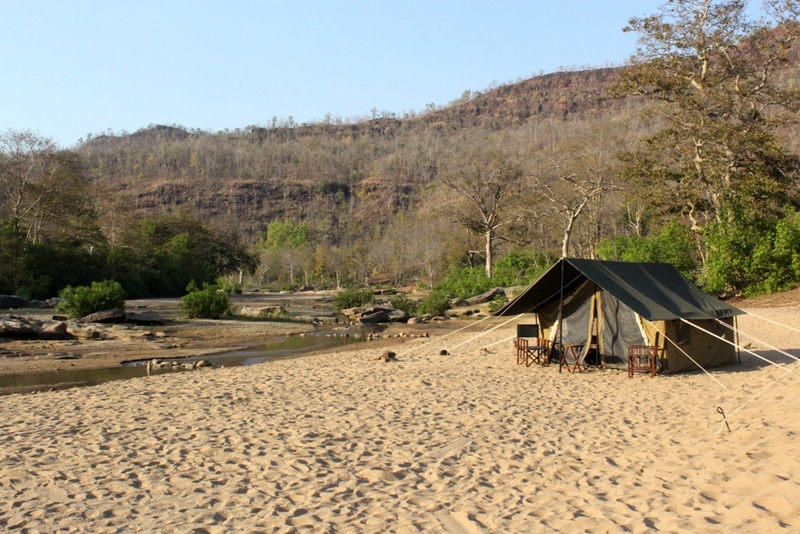 Satpura is the only tiger reserve in the country where one can camp inside the forest and undertake walking trails. During the British Raj, Madhya Pradesh was known as central provinces and the forest department of the region commenced with its headquarters in Panchmarhi. Captain James Forsyth, the man responsible for establishing and operating the headquarters had ascended to Panchmarhi using this trail. We were following in James Forsyth’s path. I had bounced back after a series of events that went against my plan. My train from CST to Pipariya was delayed by 16 hours. In that night, I cancelled my train tickets, booked a flight, informed my driver in Bhopal, returned home and slept for a couple of hours and then headed to the airport. The drive from the Bhopal airport towards the jungle lodge was another 3 hours. We had bypassed the Reni Pani village which lends its name to the lodge. Far in sight, were six staff members with the broadest of smiles, waving at us enthusiastically. Our naturalist Erwin, a 25 year old Anglo-Indian emerged from the lobby to welcome us. I sipped my welcome drink and scanned the property while Erwin briefed us on what to expect from the programme over the next few days – terrain, campsites. I also met Aly – the owner of Reni Pani. A naturalist himself and very much part of the young team at Reni Pani, you’ll often find Aly taking guests on game drives and on the Satpura Under Canvas walking expedition. Each of the 12 cottages at the Reni Pani Jungle Lodge were not too close from the other. Since there was barely any network and internet connectivity, there was no dial-in room service too. What they had was a horn, we saw in buses in the olden days. If you need anything like a dental kit or you’ve spotted an insect or lizard in your room (very common in the jungle), just press that horn to alert a staff member and it will be taken care of. 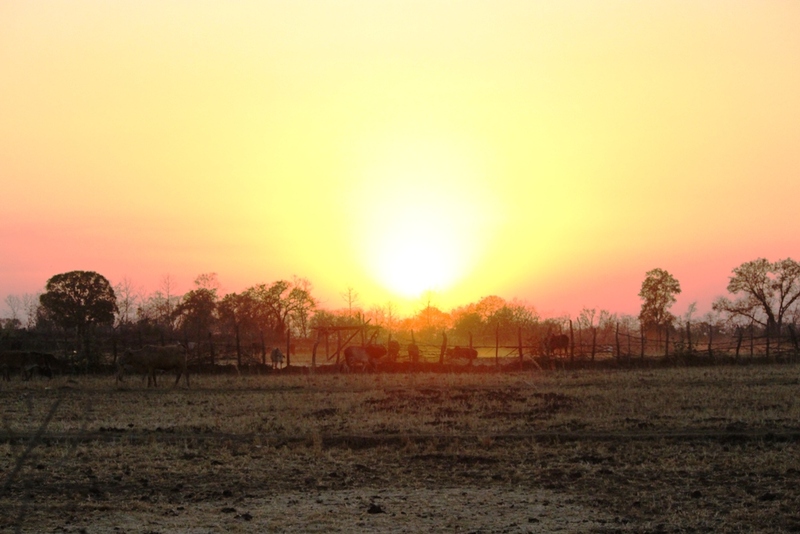 That evening after check-in, we headed for a game drive in the buffer zone of Satpura. In the jeep with us was an old couple in their sixties from Gurgaon. They asked me if this was my first tiger safari and I said ‘yes’. I asked them if this was their first tiger safari and they said ‘no’. 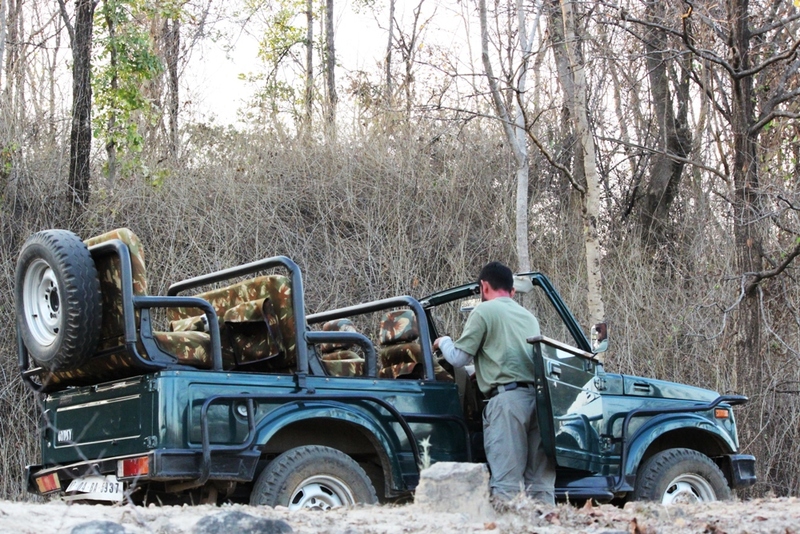 They added, ‘We’ve visited Ranthambore, Kanha, Bandhavgarh, Pench and Tadoba before’. The couple had truly inspired me to travel even more. We waited patiently at a watering hole to spot tigers but in vain. And when we were about to leave the buffer zone, we got a tip-off. 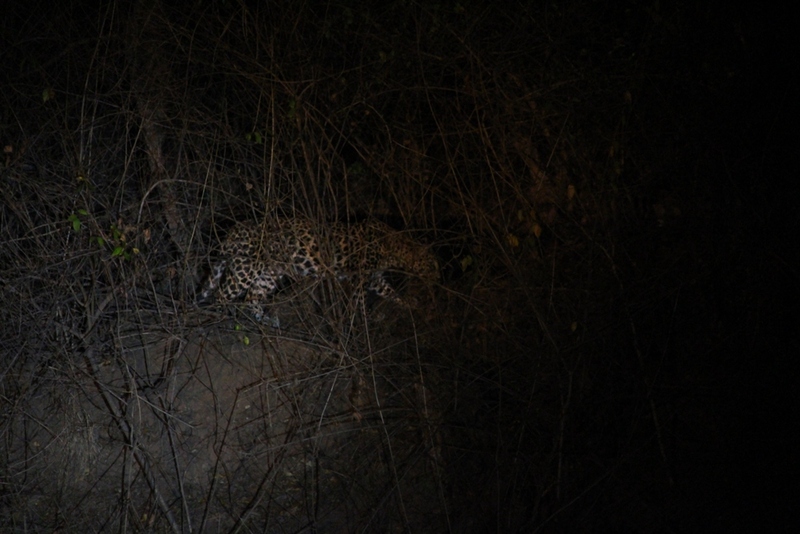 One of the jeeps had spotted a leopard lazing on his belly in the bushes, oblivious to the fact that he’s being watched with binoculars from afar. My first leopard sighting EVER! The next morning, I was sipping tea in the balcony of my cottage. The chirping of birds was music to my ears. There were no humans in sight. Just naked trees till where my eyes could see. I heard the scrunching of dried leaves and looked around to find a cobra zig-zaging in a dried up nullah. Petrified, I ran inside the room, shut the door and stayed in there. When I mentioned this to Erwin, he was calm. Cobras are territorial, he said, and this one doesn’t harm. If they got rid of this cobra, another one would mark his territory here and they don’t know if that cobra would be dangerous or not. That afternoon, two more guests (Alisha and Vikram) had joined us and we were ready to begin the Satpura Under Canvas expedition. Our first base camp was in Manchakkar, a three hour drive from the lodge. Our vintage meru-style canvas tents were put up near a meandering stream and the portable bathrooms a few meters away in the backyard in the core forest area of Satpura. The tents were strategically placed within a kilometer range of a (locked- up) forest department office. I had stepped outside my tent at midnight; the chirping of the crickets and the fear of the unknown lurked. On spotting shiny eyes with my torch, I rushed back inside the tent. May be I was imagining a creature that didn’t exist, but would I risk loitering outside…NO! The next morning, the trek had officially begun. We woke up at 5 a.m. It was chilly and dark but I was excited. We hiked 3km until we stopped to have our packed breakfast. Muffins and orange juice, bananas and sandwiches helped us recharge. The sun was not out yet so the weather really was pleasant. But by 10 a.m., my stamina was giving way. It was the month of March and central India’s heat was at its harshest. The forests were dry and the trees naked. This hike was turning out to be a lot tougher than I had anticipated. Saib was our guide and the funny man who kept the trek momentum going and the atmosphere far from intense with his one-liners. We hiked deep into the forest looking for exotic birds and getting to know more about the forest ways of life. Sal and Teak trees form a major component of the Satpura forest range. 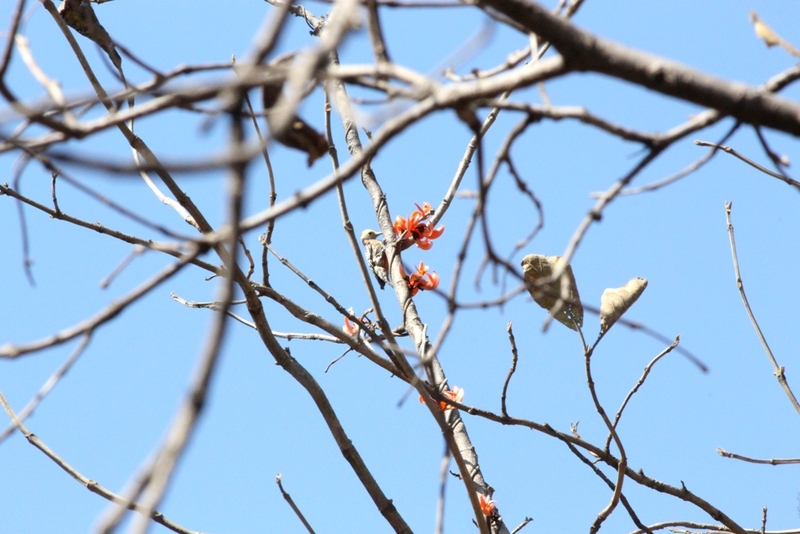 Our sightings included deers and antelope, gaur, woodpeckers and the Indian giant squirrel, carcass of a stray cattle and a freshly dead hare that was a meal of an eagle. We took a dip in the many gorges whenever we found an opportunity to cool off from the heat. The terrain alternated from a river bed to well marked trails to climbing rocks. On day 2 of our trek, I was mentally prepared and not as breathless as I had been the previous day. I walked slow and steady, sometimes to rest but other times to soak in the stunning views. In the second half, we drove towards our second base camp. 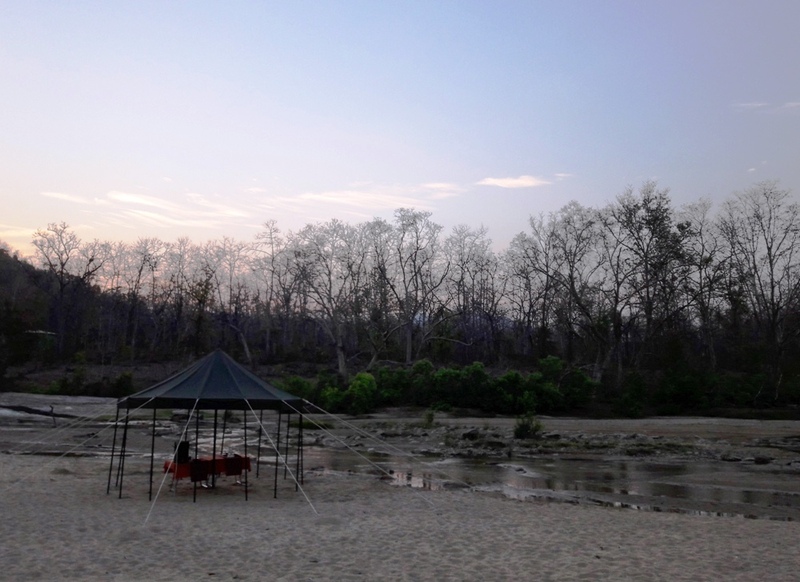 The staff had packed up the camp after we left from Manchakkar and reached before us to pitch the tents in Dehelia on the dried Denwa River bed. During monsoons, the river would brim with water, but October to March is a good time. We hiked about 21 km over the two days. Half way through our trek, elaborate meals would await us during afternoons. Think chicken rezala and rotis, rice, dal and salads, chocolates and iced tea. The camp staff would magically arrive at our next stop for our lunch rendezvous and the cook would whip up some hot and delicious food out of nowhere in the middle of the jungle. Our gypsy on game drives at nights cruised on rugged terrains, crawled rocks and snaked through wild grass. It’s an open jeep, I thought. What if the tiger chases us down? What if he jumps from a tree? What if we’re waiting for him at a watering hole and he appears from behind? I was saying my prayers secretly. Erwin seemed at ease behind the wheel though, while we had volunteered to hold the torches and look for shiny eyes in the dark. I patted myself on spotting a Civet hidden behind the trees in the deep jungle. Dinners at the camp were magical too, drinking wine and eating kebabs in front of the bonfire. Thousands of stars glimmered above while the five of us shared stories on eco-tourism. Conversations with Erwin are all about nature, conservation and exotic birds, plants and reptiles. The enthusiasm with which he narrates his adventures in the forest is both thrilling and fascinating. With no electricity and power banks, my phone and camera batteries had long died. I was cut out from civilization for four days, and loving it too! On the final day, Alisha and Vikram left for the Bhopal airport while we returned to the Reni Pani Jungle Lodge to collect our luggage. Aly, Erwin and the crew waved us good bye with the same smiles we saw when we had arrived. This time I had waved back, sharing the same enthusiasm! Oh! and our tents, chairs, beds, toilets, everything was portable. When we left, the camps left with us. There was no trace that we had lived there. Duration: 2 days and 3 nights; although the programme can be modified as per your convenience to stretch it to 3 nights and 4 days or even 1 night. Getting here: Closest airport is in Bhopal (160 km). Nearest railway station is Pipariya or Itarsi. Best time to visit: October to March is an excellent time. The forest is closed during monsoons between June and September. Check out their website for the next planned departure. Note: I received an invitation from Reni Pani Jungle Lodge. Thoughts are my own, Promise! Adventure, camping, central india, eco tourism, hike, luxury hotels, luxury stays, Luxury Travel, luxury travel in india, Madhya Pradesh, Nature, Nature trail, Offbeat Experiences, Reviews and Recommendation, tiger reserve, Travel, trek, Wildlife. Bookmark.